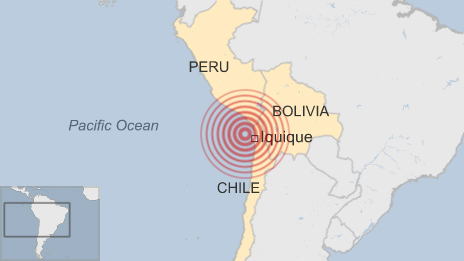 An earthquake of 8.2 magnitude has struck off northern Chile, triggering a tsunami alert for Latin America’s Pacific coastline, the US Geological Survey says. It said the quake was very shallow, only 10km below the seabed, striking 86km (56 miles) north-west of the mining area of Iquique. There are reports of 2m (6ft) waves striking some of the Chilean coastline. 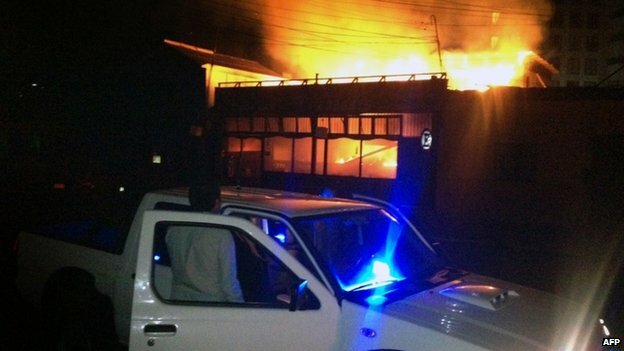 Chilean authorities have ordered the speedy evacuation of coastal areas. There are some reports of landslides hitting highways and Chilean TV has broadcast pictures of traffic jams as people evacuate coastal areas. The Chilean interior ministry told the BBC that one of the main roads outside Iquique was cut off because of hillside debris on the road. The ministry says that partial landslides have also taken place between the towns of Putre and General Lagos. A warning from the Pacific Tsunami Warning Center (TWC) said that the coasts of Peru, Ecuador, Colombia, Panama, Costa Rica and Nicaragua were all at risk of a tsunami. “Everyone along our coast should be alert and ready,” Ecuadoran President Rafael Correa said on Twitter. 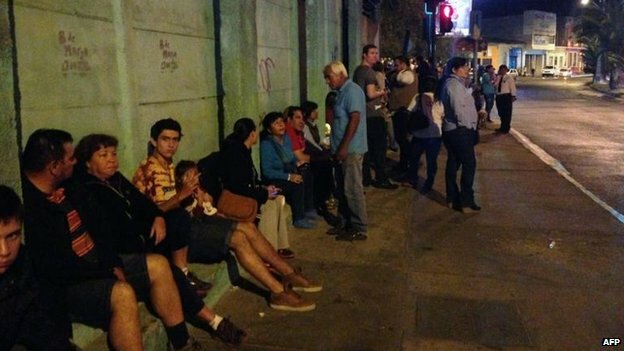 The Chilean navy said some high waves had hit the coast within 45 minutes of the quake. “We have asked citizens to evacuate the entire coast… there is no serious damage to houses… there have been no people hurt,” said Chilean home office minister Mahmud Aleuy. “An earthquake of this size has the potential to generate a destructive tsunami that can strike coastlines near the epicentre within minutes and more distant coastlines within hours,” a TWC statement said. “But this earthquake, even with the increased distance, seemed to last a lot longer,” Patrick Moore said. “I was just sitting on my bed and normally these tremors using last at the very longest about 40 seconds – this one felt like it lasted about two minutes. Kurt Hertrampf, a hostel owner in Arica, told the BBC there was a big blackout in the town after the quake and he was surprised the telephone line was still working. Central and southern areas of the country were hit by a powerful earthquake of 8.8 magnitude quake followed by a tsunami that devastated scores of towns in February 2010. The 9.0 magnitude quake that struck Japan on 11 March 2011 caused a devastating tsunami and left more than 15,000 people dead, with more than 3,200 missing.